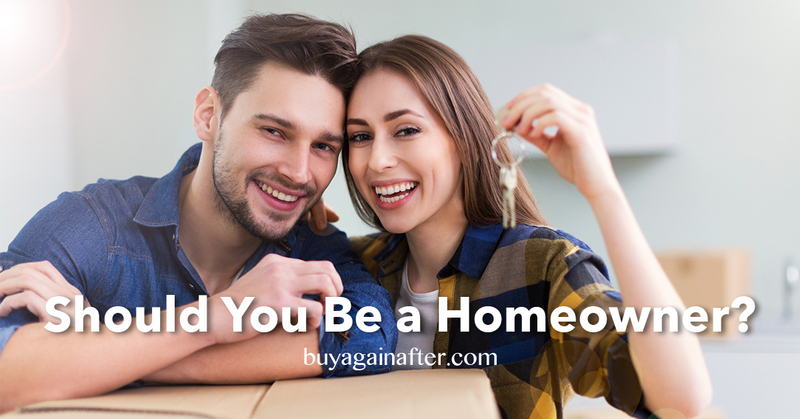 You are here: Home / How To Buy Again After / Should You Be a Homeowner? Should You Be a Homeowner? Before you become a first time homebuyer, it’s a good idea to stop and ask yourself a few questions. Depending on your circumstances, renting for a few more years may be the sound financial move to make. If you’re taking out a 30-year purchase mortgage but you only plan on staying in the home two or three years, you’re probably better off not purchasing. Why? Because originating a mortgage involves a down payment and closing costs. Even in the best case scenario, it will be at least five or six years before you have built up enough equity in your home to make owning more profitable than renting. How Fast Are Your Rent Prices Increasing? If you plan on staying in the area for a while, and your landlord raises the rent by several percentage points each year, you will benefit financially from becoming a first time home buyer. How Fast Are Home Values Increasing? If the home values in your area are static, or worse, declining, it’s probably not a good idea to invest at this time. You may be unable to sell the property when you’re ready to move, or you may get back considerably less than what you put into it. Can You Find a Home You Like? This may seem like an obvious question, but some people are so eager to buy home, any home, that they don’t stop to think about where they actually want to live for the next several years of their life. Before you take out a purchase mortgage, take some time and think about features in the house that matter most to you. If you have young children, for instance, you’ll want to consider the school district the house is in. If you use mobility equipment, you’ll want to make sure there aren’t too many stairs. Don’t commit your hard-earned money until you find a house that you truly like. One cost that many people forget to consider when it comes time to buy home is the cost of repairs. If you rent, repairs are covered. If you buy, it will be up to you to pay to fix that leaky faucet or purchase that new air conditioner. If the home you are purchasing is an older home or a fixer-upper, and you’re not very good with fixing things, you may end up sinking more money into home repairs than the house itself is worth. Again, in this case, continuing to rent might be your better option. Is There Ever a Right Time to Buy? Life is in a constant state of flux. Change happens on a daily basis, whether you want it or not. You’ll never be fully guaranteed of security in your job, your income or your life – so if you’re waiting for security, it won’t happen. You could be waiting for that management promotion… but what happens if you get the promotion and someone else buys your company and replaces all of the management personnel? What if your company goes bankrupt tomorrow? What if they restructure and eliminate your position? There simply isn’t any certainty in life, and waiting for something specific to happen before you buy is based on false hope. Accept that your life is going to be full of unexpected changes, and do what you can to mitigate the risks – and then go for it! While you’re waiting for that promotion, or waiting to meet the woman you want to marry, or waiting for the baby to come along – you’re losing money! Now is the perfect confluence of low mortgage prices and a housing market that is steadily rising. If you wait further, you’ll have lost potentially thousands of dollars – or more – as prices rise and mortgage rates increase. Wait a year or two, and you could be talking tens of thousands of dollars. So stop waiting! Take advantage of the ideal housing market conditions and make now the right time to buy your home. There is no simple answer to the question of renting vs. buying. You must weigh all the different factors and make a decision that is appropriate for your unique circumstances. Only you can answer that question. There are circumstances where buying a home is a very sound financial move to make, and circumstances where renting is probably your best choice. It’s easy to look at experienced homeowners who get their hands dirty and know how to take care of a home, and feel daunted by how far you are from that point. But keep in mind that nobody started out as a first time homeowner already knowing how to do it all. It is with months or years of home ownership that you garner experience and figure out the important nuances of home ownership. So keep in mind that nobody expects you to be an expert when you first buy your home: you can grow into becoming a responsible home owner. A lot of what determines whether you grow into becoming a responsible home owner is your attitude. If you go into home ownership with an open mind and a willingness to make it work, you’ll probably find that home ownership suits you. Many things around a home, you can do yourself after reading online, watching videos or consulting with other homeowners. If you want to get more in-depth, you can take a local course at a community college or trade school. You won’t just wake up one day being a successful home owner – you’ve got to learn by doing and gradually acquire the skills to deal with the challenges you face. But with an open mind and a positive attitude, you can grow into home ownership – and you might just find that you like it.